Tryg, the second largest Scandinavian insurer, provides general insurance services to more than three million customers. Providing value and assurance, Tryg wanted to focus on understanding their customer’s needs. Despite six brick and mortar offices across Norway, Sweden and Denmark, most customer engagements took place online. Tryg wanted to understand visitor behaviour to improve website user experience. Website updates and amendments were executed by outside development teams. This involved a four month turnaround time for simple tag changes. Additionally, only web analytics experts could produce or understand the visitor data collected from the site. Before any developer could begin, a clear brief and scope of work needed defining. Each task required 10-30 hours of support from the business intelligence team to assist. “The ease and speed at which projects can be delivered using Tealium iQ™ is a real game changer for Tryg. As a web-analyst who was heavily involved with the deployment of Tealium, I am very proud of what we have achieved,” Martin Vinter. Tryg deployed Tealium’s iQ™ Tag Management solution to bring more control in-house. The platform enables Tryg to deploy tags faster and reduce the budget for minor development tasks. With full visibility, Tryg are now also able to control the collection and control of their data. The controlled sandbox environment Tealium iQ™ provides enables teams to experiment with working solutions. Improved data quality means the teams are able to rapidly overcome individual challenges quickly; many are resolved in under two hours. Tealium iQ™ has eliminated the need for ‘workaround’ solutions. Providing wider teams with controlled access to Tealium iQ™ has reduced Tryg’s dependency on outsourced developers. Greater internal resource has allowed Tryg to fast track many of the scheduled website improvements for the year. The business have recognised the increasing productivity, reduced bureaucracy and more agile processes; facilitating critical releases outside of the standard web release cycle. “Things are very different now in a great way. Tags can quickly be altered without lengthy developer briefings. Analysis can be conducted by numerous people, which means data can be shared and used more effectively across the company. Tryg has seen a major shift in how the company operates from previous ‘gut feeling’ methodologies to data-oriented, informed decision making processes and strategy. The great news is that this is only the beginning!” Martin Vinter, Online Business Developer, Business Intelligence, Tryg. In the first year Tryg deployed more than 100 Tealium rollouts to production. Many included changes to the tags fired and data collected from the website. Prior to Tealium, Tryg managed less than 15 tag changes per year. Tags were hard coded to the website and the cost of making changes was prohibitive. With Tealium iQ™ Tryg is now able to update the tags being fired within minutes. Tealium iQ™ introduced the concept of iteration to tag management; increasing the quality and broadness of the data collected. Tryg’s data collection method is continuously refined to meet ever-evolving departmental and company requirements. “The result is not so much that we’ve freed up time, we’ve just become much more efficient with what we’re getting done. We’re now able to get complicated tasks completed within a day or so, as compared to an average of four months. Simple tasks only take 10-20 minutes to complete now, compared to a minimum of two months,” Martin Vinter. Uniform data has directly benefited multiple departments at Tryg. The digital and marketing teams have greater visibility into each visitor engagement. The insights generated have been shared across the business for everyone to learn from. The business intelligence team has used this to improve data modelling capabilities. This data is then delivered to Tryg’s data warehouse in real-time for decision analytics; a project fast tracked by Tealium iQ™. Tealium iQ™ has given Tryg the time and flexibility to start exploring projects that were previously not feasible. A number of use cases Tryg have now built were theoretically possible using their previous IT-landscape. However, the time and consultancy costs involved would have prevented the required approval to execute them. Tryg has also been nominated for a total of seven other awards for their marketing programme, detailing their use of Tealium iQ™ in each entry. Moving forward, Tryg will be continuing to deploy Tealium iQ™ across all of their websites in line with their major overhaul project. The tag management approach to data will replace any remaining hard coded tags during this process. Tealium iQ™ has connected the majority of systems collecting web or customer data; Tryg is now looking to feed their email and SMS engines with data from the Tealium platform. 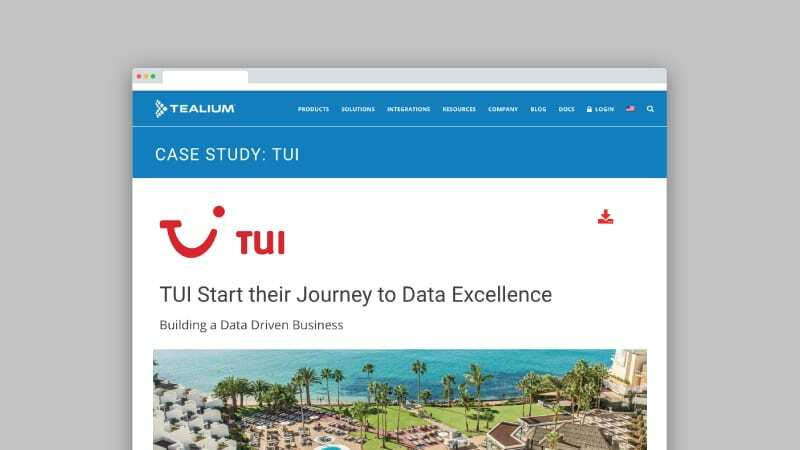 In light of the success experienced, the business intelligence team is looking to leverage Tealium’s Universal Data Hub to support their growing data requirements. This will also help the marketing team who are focused on creating a single customer view through data unification. Stitching together real-time customer profiles would enable Tryg to respond to online visitor engagement in real-time. Tryg forsikring is the third largest non-life insurance company in Norway. The company has approx. 1,100 employees in Norway and a premium income of NOK 7.9bn in 2016.